I was delighted to have been asked to be a judge for the Stevens Competition this year and so I had a much needed day away from the studio yesterday with an invitation to make my way to the University of Wales. 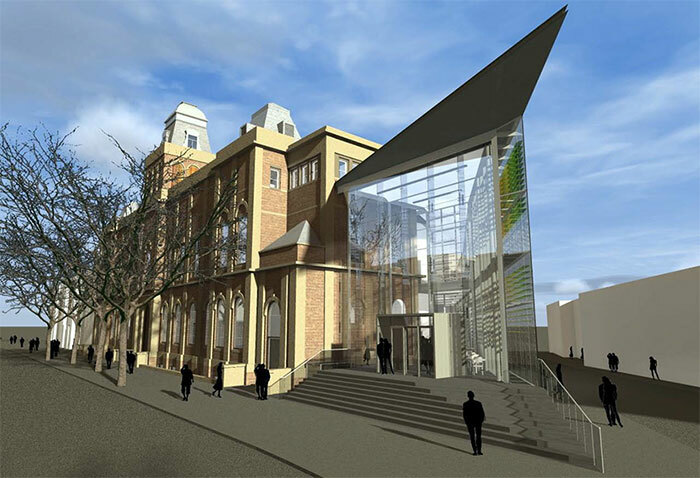 The commission attached to this year’s competition is to be offered at the newly renovated School of Glass in Swansea. Having read about the building on the train journey from Paddington, I was looking forward to see how the architects had integrated a modern glass extension onto the original building which was contructed in 1887. I had been told the campus was five or ten minutes from the station, and so taking directions from customer services in the station and following the map on my phone I was slightly bemused when, twenty minutes later, I found myself still walking up an interminable hill looking for the open campus I had imagined from looking at the architect’s image (above). When my mobile told me I was at my destination, I knew I had been misdirected. It was the wrong building! It turned out that the School of Glass was at the bottom of the hill right in the middle of the town centre – I had been directed to the School of Art surrounded by space at the top of the hill. Don’t you just love those architects’ drawings which blank out the hustle bustle of the surroundings?! I must have walked right past it staring at my mobile! 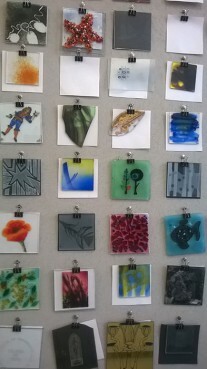 Anyway I finally joined the other judges on the tour around the building led by Dr Vanessa Cutler who runs the degree and PHD courses in glass at the University. Our group was later described as “kids in a candy store” looking at the facilities, and it’s not surprising – I was wildly envious going from room to well-equipped room full of what looked like brand new equipment! 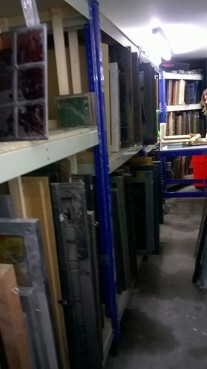 It was like being taken into a stained glass treasury when we descended into the basement store, packed to the gills with racks of sample glass panels from previous Stevens Competitions. We joked that somewhere within the warren of rooms would be hidden an original Johannes Schreiter panel, but in fact we only had to look up to see a Schreiter panel installed in the staircase to the Glass department, a legacy of the time in the 1970’s -90’s that German Masters came and worked with the students in the School. 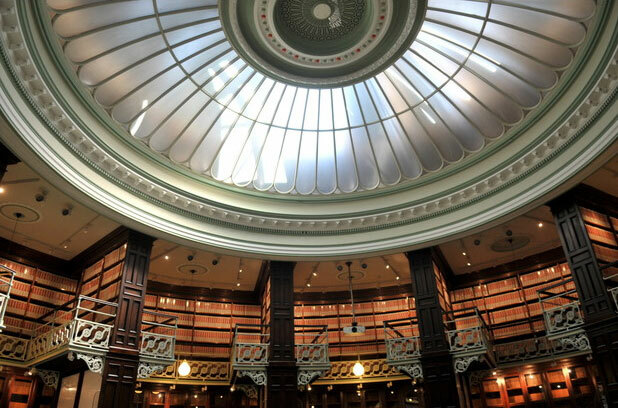 The last room we visited in the beautiful grade II listed building was a stunning circular reading room, once the Swansea Central Library, temporarily used as a Doctor Who set and, after the building was acquired by the University, briefly used as a leading room for the Stained Glass courses. 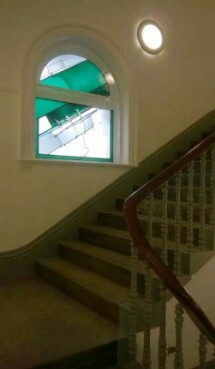 The architects had applied a light touch when renovating this splendid Victorian interior, though they had managed to shift the entire entrance porch a metre forward into the space to allow for disabled access. After a jolly lunch in the Dragon Hotel down the road, we disbanded again embarking on our various train and car journeys back to our respective homes around the country, and agreeing to meet again in Southwark Cathedral in April for the judging of the compettion. 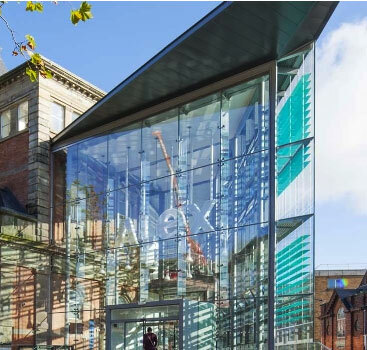 On the train on the way back, I looked at further online images of the lovely building and realised with some irony that there had been a big clue calling out to me to announce the location of Alexandra Road campus…. I managed to walk straight past an enormous sign with letters four feet high saying “Alex”.